Chicken Wiggle is the latest retro 2D platformer from the creator of Xeodrifter and Mutant Mudds. Both games are widely acclaimed as 3DS eShop gems. But did this game wiggle its way into my heart? Or did it crawl out of the earth, only to dry up like a worm on the sidewalk? The protagonists of the game are a chicken and worm duo, the latter riding in the backpack of the former. On his own, your chicken can’t do much: walk left and right, peck his beak to deal out some damage to enemies and breakable blocks, and jump one square high. With the worm by his side, he also has the ability to use the worm like a grappling hook, zipping towards out-of-reach blocks and stunning enemies. The core gameplay is extremely simple and intuitive. The limitations of your moveset lend themselves well to puzzling levels, and the duo is surprisingly mobile when it comes to getting around. Anyone who’s played Xeodrifter or Mutant Mudds won’t be surprised by the graphical style on display here. The pixel sprites are chunky, colorful, and extremely basic. The entire package gives me GBA vibes for some reason. The look of the game is standard indie game fare, and doesn’t do a lot to stand out visually. Better pixel graphics are easy to find on the 3DS. The music is a bit of a mixed bag. Some songs are catchy (the upbeat construction site theme is my personal favorite) while others are forgettable. The levels in the main game are spread across 8 towers, with 6 levels in each. In each level you’re tasked with getting to the end, to free one of your fellow birds. Along the way, there are 100 gems to pick up, along with 3 “F-U-N” tokens. These are optional, but getting every hidden item rewards you with an indication on the level select screen. Each tower has a new theme, with different music and themes, from construction site, to ghost house, to cloud kingdom. But the level design is always solid and usually feels fair. 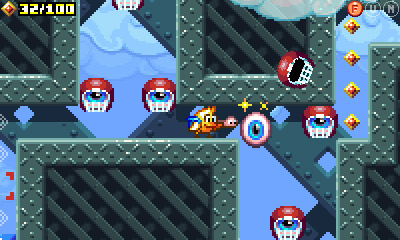 You’re most likely going to die a lot as you travel through Chicken Wiggle’s campaign. One hit is an instant death, after all. But lives and retries are unlimited, and each stage has one checkpoint, which keeps the game from becoming too frustrating. Most stages introduce a new type of enemy or hazard, and the difficult curve is steady from the beginning to the end of the game. Power-ups are scattered throughout the game as well, including (among others) a jetpack for a double jump, a superhero cape for unlimited flight, and a construction hat that allows you to destroy almost any block in the game. Throughout most of the game, I was constantly surprised and excited by all the new mechanics I encountered. The powerups, enemies, and hazards all seemed like perfect elements to craft tricky, rewarding puzzle stages, full of a lot of variety. But despite all the tools available, the stages ended up being repetitive. There were a few puzzling bits with new enemies, spikes, and power-ups, but the stages were all mostly linear in design. By the end of the second or third tower, finding every F-U-N token and gem stopped being any FUN at all. I started listening to podcasts while collecting each token and gem, just for the sake of completing the game. Once you’ve completed every stage, the game ends with its only boss fight: an underwhelming showdown with the witch who appeared in the opening stage. I had completely forgotten about this character by the time I reached the boss, and the battle itself was fairly easy. The ending cutscene (if you want to call it that) is even less interesting than the fight. The story is clearly not the focus of a game like this, but I thought it was worth mentioning just how non-existent it is. However, everything changes if you stop playing the campaign, and turn your attention to Chicken Wiggle’s primary attraction: a level editor, and online stage sharing. This was always intended to be the main draw. Every level in the campaign (with the exception of the final boss) was actually created using the level editor, which was designed before any of the stages. 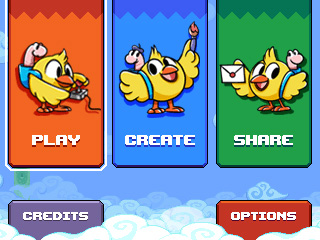 Every single level in the campaign had the same goal of rescuing a fellow chicken, located at the end of the level. This is strange because the level editor allows you to choose several different objectives: collecting every gem, getting rid of every baddie, or even escorting a skeleton enemy to his home. This opens a wide variety of new gameplay opportunities, and I’m downright baffled as to why none of these are included in the main game. The level editor itself is very easy to use. It’s almost as intuitive and fun as the one included in Super Mario Maker. You have access to a wide variety of enemy types, hazards, and puzzle and gameplay elements, including some that never showed up in the main game. Your canvas, while not infinite, is quite large, which allows quite nicely for both vertical and horizontal level designs. It’s also easy to switch between editing and testing. Once you’ve finished and beat a level (to avoid any impossible stages being posted on the server) you get to name your stage, add a short description or hint, and upload it to Chicken Wiggle’s online service. 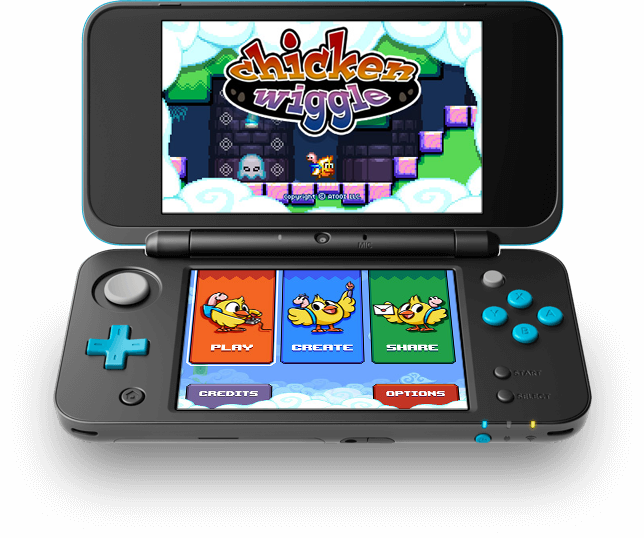 The online service is perhaps where you will spend most of your time with Chicken Wiggle. There’s no “100 chicken challenge” or anything similar to the 100 Man Challenge in Super Mario Maker, but it is pretty easy to find high-quality levels. You can sort by newest, highest rated, and even least played. There’s also a great section of “Atooi Picks” with some fantastic stages collected and curated by the game’s developers. You can play levels online, or save them to your system for later, as well as “heart” your favorites. I have played dozens of user-created levels and have been impressed at the variety and level of creativity on display, and I hope to keep coming back for more. If you love creating your own levels, Chicken Wiggle is easy to recommend. Even if you are not interested in designing stages, the overall gameplay is enjoyable and there’s a lot of user-created content available to keep you busy for a long time. Nothing about Chicken Wiggle is amazing, but if you give this chicken a chance, you won’t regret it. SOUP VERDICT: If this game was a soup, it would be chicken noodle. Nothing mind-blowing, but not bad at all!